The title Shin-eui means faith, as in belief in justice. But in Hangul it’s also a pun on God + medicine, as a play on the medical and the fantastical, two major elements of the world. It’s a re-imagining of a what-if version of history, potentially changed on a massive scale by the actions of two individuals. 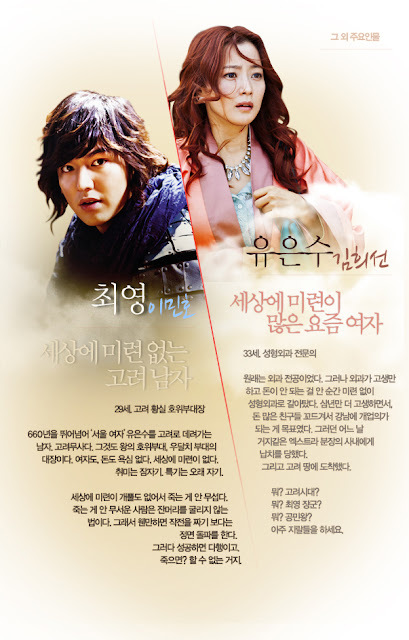 The taglines for the show: “Fantasy and history will meet. Person and person will meet. Person and heaven will meet.” It’s described as the epic story of those that will shape a king and change the course of fate. A bodyguard to the king in the year 660. He’s 29 years old and has no regrets in life, and no ambition for women or money. His hobby? Sleeping. His specialty: “Sleeping for long periods of time.” Ha. Catnapping warrior it is. A 33-year old plastic surgeon in the year 2012. She was originally a general surgeon, but quickly found that it was an overworked, under-paid profession and jumped ship to plastic surgery. Her dream is to someday open her own practice. But one day a strange man she thinks is dressed as a drama extra kidnaps her… and takes her back to the Goryeo era. Their love story spans centuries but also warring beliefs. He gave up on love to be an unflinching warrior. She doesn’t believe in love or trust anyone.